De grote lichten in deze wereld worden verguisd, tegengewerkt, aan het kruis genageld, achtervolgd. Denk aan Jezus, Bruno Groning, Ghandi, en ook Osho. Wild Wild Country is een indrukwekkende docu over de weerstand tegen de commune van Osho en hoe alles uit de hand liep. Nu te zien op Netflix. For as tidily as “Wild Wild Country” can be summed up — “It’s the docuseries about an Indian cult leader!” — the show overall is an incredibly dense examination of religion, immigrants, and Americans’ perception of both. As intense as it is illuminating, the six-episode Netflix series deconstructs misconceptions about cults while exposing incredibly dark secrets at the same time — and that’s where the doc finds its power: Just when you think you know what it’s about, there’s quite a surprise around the next corner. Directed by Chapman and Maclain Way (“The Battered Bastards of Baseball”), “Wild Wild Country” focuses on what at first seems like a relatively simple conflict. Followers of an Indian spiritual guru decided to build a commune in Oregon, and their neighbors were none too pleased about it. But what started as an uncomfortable wariness of the unknown soon turned nasty, then openly hostile, and quickly grew into a racially fueled attack on religious freedom on one side and the literal survival of a town and its citizens on the other. “Wild Wild Country” delves into the takeover of Antelope and the poisoning of its citizens (yes, poisoning), but it’s important to grasp the bigger picture so carefully and exuberantly crafted by the Way brothers. Starting in the early 1970s, Bhagwan Shree Rajneesh had established a faithful following of sannyasins who believed in his ideas about free love, anti-socialism, and the “new man”: the complete, ideal version of humanity that had yet to be achieved in the East (through Buddhism) and in the West (through commercialism). Based in India, Bhagwan (also called Osho) wants to move his operation to a more open society, and here’s where “Wild Wild Country” starts to show off its selective storytelling — choices that prove all the more rewarding for the viewer. At first, the documentary frames Bhagwan’s idea to move to America as a necessity: The Rajneesh movement is expanding, and they need more room (and less governmental restrictions) to accomplish their goals. His secretary, Ma Amand Sheela, visits various countries across the globe and settles on Oregon as the best option. 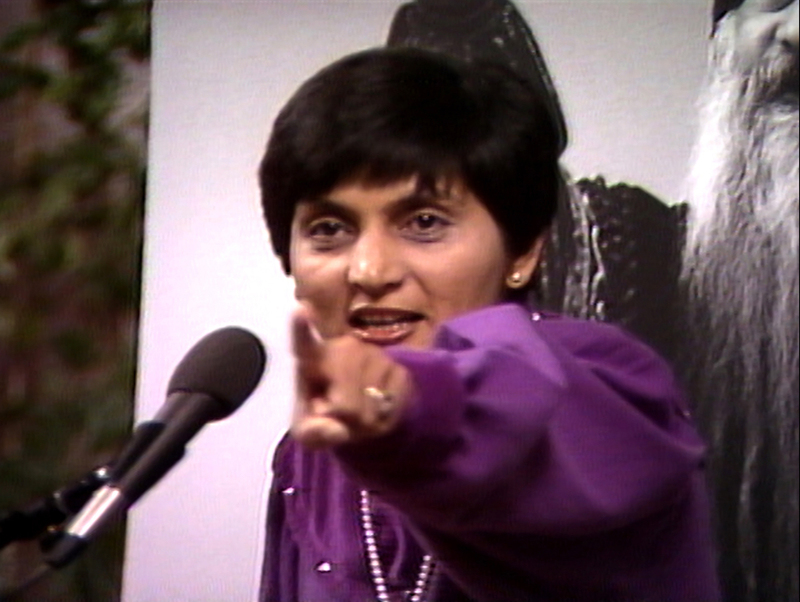 “Consider yourselves lucky this opera came your way,” Sheela says in a news footage used in the doc. Well, the locals disagree, but eventually it’s made clear that Sheela, Bhagwan, and the movement as a whole were the lucky ones (at first) to find a place like the Big Muddy Ranch. The group uses whatever legal means are at their disposal — be it immigration visas for religious leaders or “easy voting” laws in local elections — to get whatever they want, and for a time, the citizens are powerless to stop them. Then more drastic actions are taken, the secrets start to come out, and a local dispute turns into an international manhunt. The Way brothers use an astonishing amount of found footage to tell this fascinating story. The first episode ends with a little kid slamming his door shut after seeing Bhagwan walking through town. There are news reports from local and national outlets covering every piece of this conflict. Interviews from those reports show locals openly admitting to not liking the outsiders, but there are just as many interviews with Sheela saying horrible things about the townsfolk. Sheela — an outspoken figure who’s clearly a little too in love with the spotlight — is bound to be a polarizing figure for viewers. Even before accusations start getting tossed her way, she’s the antithesis of what Americans have come to expect from religious leaders. “Jesus said, ‘turn the other cheek,'” Sheela says after facing the first bit of resistance from Antelope residents. “Well, we say take both cheeks.” While she doesn’t engage in outright hate speech, Sheela is unafraid to provoke the masses. From early footage alone, she’s the kind of person you expect to be in jail or in hiding, but the Way brothers found her. She’s a prominent part of the present-day commentary, alongside the current mayor and long-time resident of Antelope, a number of local ranchers, and a few key Rajneeshees. Their thorough recollections of the past as well as their passion and honesty make them tremendous talking heads. The Way brothers have collected eyewitnesses to history and paired them with telling footage — not to mention a spirited, driving score by Brocker Way — making “Wild Wild Country” uniquely absorbing. Even with ’80s clothing, hairstyles, and innumerable other period markings reminding viewers of its setting, you feel like you’re living this story out as it happens. By the end of the six-plus hours, there’s a clear message of American intolerance and how the country’s first immigrants respond to new immigrants trying to change things. There’s also a soft commentary on the accessibility of firearms and what problems can result from that convenience. It’s all quite relevant to today, but more than anything, “Wild Wild Country” does what neither side did in the ’80s: It pushes past the assumptions, the rage, the discrimination, the overt and implied xenophobia, and the troubling connections between church and state to illustrate what these people have in common and what prejudices drove them apart. It takes the time to dwell in every conceivable emotion, and your opinions of certain individuals may shift repeatedly throughout the six episodes. It’s a challenging piece that requires the viewer to acknowledge their own reactions and then question them. In that, “Wild Wild Country” may be even more vital to a divided nation. It demands you see the other side.